Welcome back, at Make My Monday we are pleased to start the new year with a new topic, it is the turn of Fliss to choose the week's in January weekly topics, her overall month's theme is NATURE. We are starting off for the first week with BIRDS. A very popular subject during 2011, so we are hoping to see lots of entries, please pop over to see the team's samples for there is such a wide variety. ﻿I choose to use a DL card, I do like them for some cards, for they give depth. The background to this card is the result of one of those messy spritz and spray sessions I so enjoy from time to time. I use so many methods of just making a mess, I can't recall the colours I used but they would be a mixture of Cosmic Shimmers and TH Distress Inks, with a few splashes of clear water here and there. I stamped the flowers and humming bird with memento Tuxedo Black ink and then heat embossed with clear EP. I used a black card to matt it, then onto red card. Small diamond jewels were added, for a little extra bling. Sadly Cosmic Shimmers don't shimmer on photos as they do IRL. Stamps used are from Kanban. I look forward to blog surfing to see your first entries in 2012 to our challenge blog at Make My Monday. 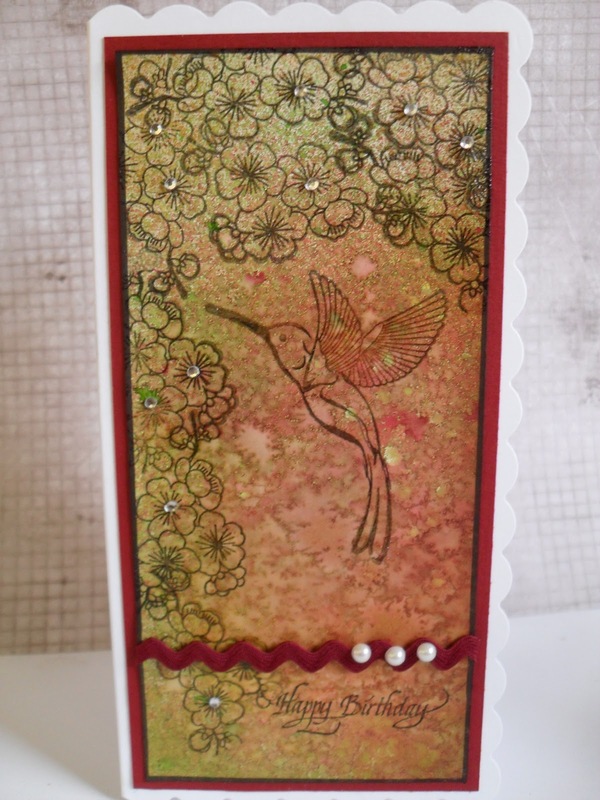 Hi Caz, love the pretty background on your card and the stamping looks really lovely on there too. Wishing you a Happy New Year and a great 2012. A fabulous background and great design using the stamps you have chosen. Love it. Beautiful card, the background is stunning as well. Like the new look on your new blog. You've chosen a wonderful card. Great background, love the humming bird. 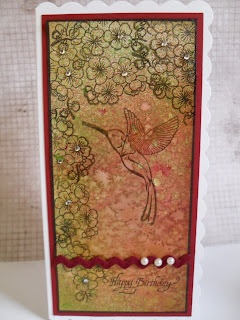 Beautiful card Caz using my favourite hummingbird! Caz, this is just GORGEOUS! LOVE that hummingbird--it's so wonderful! Thanks for commenting on my blog candy post. :) The linky button wasn't working, so if you'd like a chance to win it, would you mind popping back over and linking up? I'm choosing the winner based on the number your link is...sorry for the inconvenience! Wishing you and yours a wonderful 2012!!! Just gorgeous - fabulous background inkyness, and I love the simplicity of the card. Hi, thanks for visiting my blog. I love the gorgeous inky background on your card. One of my crafty resolutions this year is to be a bit messier! That hummingbird is lovely. Happy New Year!